Is it a laidback process to make the big move to a self-hosted WordPress website? Absolutely not! It can be an uphill task. Nevertheless, it is always the right decision. But why should you make this big move anyway? A self-hosted WordPress website always comes with tons of benefits. Thanks to plenty of customization options possible with the WordPress.org version! Plus, you don’t have to depend on other company to keep your website up and running. Sometimes, it can create panic when you are migrating to WordPress self-hosted version. Though it is a vital step, so it needs a careful planning beforehand. From getting a domain registered for your brand new website to choosing the ultimate hosting service provider, the things need to be kept uncomplicated. The step-by-step process we are going to discuss in this post will definitely make the task smooth and effortless. It is very important to choose the right web hosting provider because it can make or break your website. You can take the help of any expert WordPress development company to make the things easier on your part. Once you are done with purchasing hosting service provider, it’s time to take the real plunge! Install WordPress from here for free. If you download WordPress from the .org website, you will have to install it manually. Instructions are very much available and it will take upto 5 minutes for the whole process. On the other hand, if you have purchased a hosting provider like BlueHost or Pressable, you can just press on the one-click installation button which comes with hosting service. WordPress will be up and running in no time! Here comes the most exciting part of embarking upon the journey of building a WordPress.org website. You control your website appearance and customize it according to your requirements. Don’t you want to create a website unique to your brand or company? It is the right time to infuse a life into your website by choosing the most appropriate theme from the repository. All the content on the old website can be moved except the theme and widgets. So, choose the widgets that are required by your website at this step. This would be possible when the theme would be installed and activated. In the Settings>My Site of your WordPress.com dashboard, click on the Site Tools to start downloading XML files. However, if you want to export your chosen data, you can click on the small arrow near the Export button. In the admin area of WordPress.org, click on Tools>Import>WordPress. Click on the file you want to import and download the attachments. Import your XML file. After you are done with the above step, you are pretty much done with the migration, except the domain game. Contact your hosting service provider if they sell domains. You can even transfer your already purchased domain name to the new WordPress website. There is a Site Redirect Upgrade option also, if you want to redirect your site users. You may even have the option to update the name servers. You are almost there! Just need to install Jetpack by WordPress to your brand new self-hosted WordPress website. Jetpack by WordPress is the most popular plugin by Automatic. It is a power-packed plugin which takes care of all the aspects of your website. You can download it from here. It pretty much does all the core tasks which your website requires to be efficient and advanced in all perspectives. Website security and traffic stats are available. Get website stats and analytics using Jetpack. SEO and promotion tools are also available. The steps discussed above for the WordPress.com to WordPress.org migration are pretty much the fundamental steps. Let’s quickly skim through them again. Choose a web hosting service provider according to your requirements. Purchase the hosting plan. 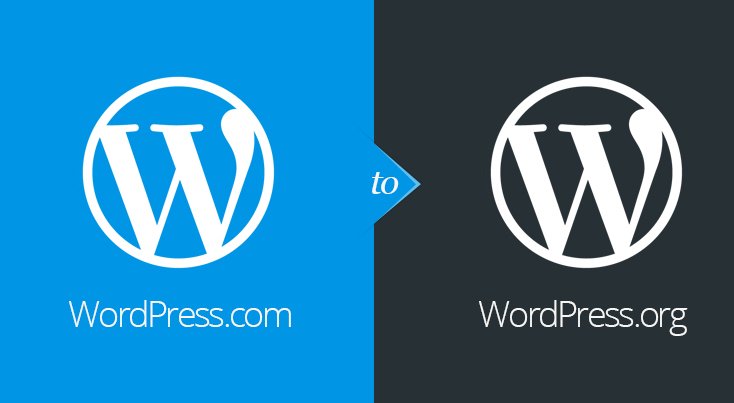 Go for installation of WordPress. Choose a WordPress theme for your website and customize as you fancy. Export/ Import data and you are good to go! Install Jetpack plugin to take advantage of the WordPress features. Cheers! You are all done with the step-by-step guide. Have a great time building your very own self-hosted WordPress.org website and share your experiences with me.